A hedge is a continuous row of trees or shrubs, either low growing or high and closely planted to provide a boundary line, screen or ornamental feature in gardens or estates. This word has been highjacked and used in expressions like hedge your bets, stop hedging, hedged in. Having spent some time in the British Isles where there are over 500,000 miles of hedgerows and where many of the most famous gardens contain numerous kinds of hedges, I started to think about the American attitude towards this living fence. For a large number of Americans, a hedge is a negative term, generally considered a poor choice for the yard. Vita Sackville-West, the renowned English garden designer of Sissinghurst Castle, reported in her weekly gardening column for The Observer newspaper in August 1950, “Our American friends do not like hedges. They do not share our love of privacy, and maintain that if you plant a hedge round your garden you are doing something undemocratic and may even have ‘something to hide’….” Interestingly, the very rich in America are not burdened by such self-consciousness and a hedge is considered an important symbol of privacy and exclusion. Consider the Hamptons with its tall hedges like the walls of a medieval castle. Interesting, too, how the most privileged among us has borrowed the word ‘hedge’ to define an elite form of investing. The ‘hedge fund’ is an elusive kind of hedge and is not, as yet, defined by the Securities and Exchange Commission. The words to describe the strategy used by hedge fund managers obfuscate what’s behind this privileged form of investing. It seems that the word ‘hedge’ has taken on different meanings to different classes. While I was planting the first of the plants for my new hedge a neighbor arrived unannounced. After greeting each other she asked what I was doing. I explained I was planting a hedge and she immediately replied, “What do you want to block out?” I was a little taken aback by her response. I said that my intention was not to block anything out, except perhaps the field of looming burdock behind the orchard, but that I wanted a hedge to frame the orchard. I thought the straight line of hedge behind the gnarled apple trees would contrast well with the twisted trunks and add color throughout the seasons. My neighbor did not seem to grasp the concept and continued on about how a hedge might block out some unwanted future construction. After she left, I pondered this seemingly prevalent notion that a hedge is something to block rather than to contain. Rhamnus -‘Fine Line’ hedge- has a willow leaf texture. The hedge has had a bad rap in America. The Cole Porter song “Don’t Fence Me In” was written in the ’40s. The story tells of Wildcat Kelly on his way to jail. Dreading his incarceration he pleads to the sheriff, “Oh give me land, lots of land under starry skies above, don’t fence me in.” Porter’s song struck a deep chord in the American psyche. Many settlers came from incarcerated situations of one sort or another. Perhaps our longing for openness is an exaggerated response to the confines of our forebears. When I was young, my Uncle Jimmy, an avid gardener, put up a stockade fence around his property to protect a neighbor’s child with Down’s syndrome. He enclosed his garden to prevent the child from wandering aimlessly into his garden and falling into the koi pond. A few weeks after the fence was built someone spray-painted “Fort Apache” across the fence in large black letters. Each time my uncle removed the graffiti it would reappear. He, unknowingly, stumbled on a deep American prejudice. A hedge doesn’t have to be used exclusively for blocking out. With the threat of running out of fossil fuels wouldn’t it be a good idea to eliminate some of our lawns in order to conserve energy? 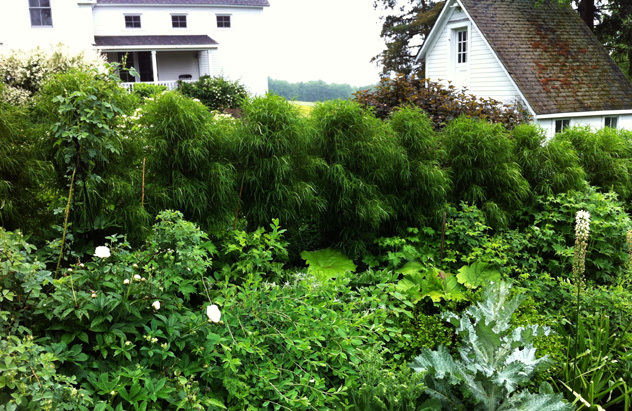 Planting shrubs or a hedge could reduce a lawn by half. A hedge doesn’t have to be very tall. By choosing the right variety of shrub, a hedge can be any height from a row of nine-inch dwarf boxwoods to 30-foot arborvitae. By introducing a hedge into your garden you add a wildlife habitat. In Britain half the total species of mammals, most of the reptiles, and a fifth of the bird species can be found in the hedgerows. Having decided to throw caution to the wind and to plant a hedge in my orchard behind the 100-year-old Northern Spy apple trees, it took me a while to figure out what type of hedge I wanted and what would work in this northern climate. My garden in upstate New York is in zone 4, our elevation is 2,100 feet above sea level. It’s a cold spot, to say the least, so my hedge would need to be hardy. My first thought was to have an evergreen hedge, either Taxus yews or Ilex meserveae (China Girl holly). I love its dark green foliage and it would add interest to the garden during the winter months. The problem is that deer love both these plants and feast on them during the bleak midwinter. In order to protect them from being eaten I would need to cover them with burlap or erect a fence which would defeat the purpose. I was nervous about planting hawthorn because it grows everywhere in Delaware County. After researching the different varieties of plants and zones, the real work was in trying to locate the plants. Many of my first choices were quickly eliminated because the plants were unavailable. I decided I wanted an informal hedge about 4 feet high and that I wanted something for each season. I finally chose plants that are not uncommon to our region: red chokeberry, Aronia; flowering quince, Chaenomeles speciosa Jet Trail; Scotch rose, Rosa spinosissima; and blueberry bushes, Vaccinium angustifolium — Northland (a more compact variety). All of these plants have flowers in the spring and fruit in the summer or fall. The Aronia and blueberry also have brilliant fall color. The blueberries will be an edible bonus. The Aronia was the only plant readily available from local nurseries and I mail-ordered the others. After seeing many renowned gardens both in Europe and the United States, I have decided that hedges are the bones of any good garden. Tall hedges add another dimension to the garden as they pull the eye above our heads to create vertical interest and structure. A wall of dark evergreens planted behind a flowering border helps to sharpen and define perennials and annuals that are planted in front. A hedge needn’t be considered a device to hide something. There are too many wonderful possibilities of what a hedge can be to let a narrow-minded concept prevent the gardener from exploring its assets in one’s garden. Taxus x media, English-Japanese yew. There are several varieties including Lloyds yew, Hicksii yew, 15 to 20 feet high, 5 to 8 feet wide. Zone (4) 5 to 7. Taxus baccata (Repandens) is a low growing variety reaching 2 to 4 feet high and 12 to 15 feet wide. Zone (4) 5. Thuja occidentalis Nigra — American arborvitae, grows 40 to 60 feet high. Zones 2 to 7. Varieties include Nigra, 20 to 40 feet high. Techny grows slowly to 15 feet and has a bullet-like shape, very common in graveyards of the northeast. Tsuga canadensis — Canadian hemlock, 50 to 75 feet high (zone 3). 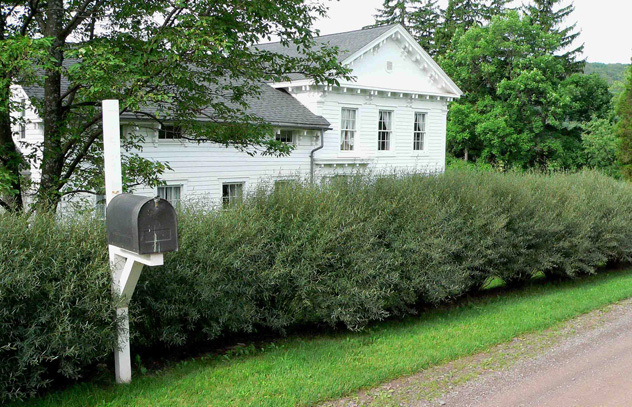 The plant fell out of favor in the 1980s to ’90s because of woolly adelgid infestation. Better control techniques and fewer host plant numbers have put this plant back on the list of best hedges. Buxus microphylla koreana — Korean boxwood, 4 feet high (zone 4) is a good evergreen for colder climates and the deer hate this plant. Varieties of deciduous shrubs worth considering for an informal hedge are hedge maple, hydrangea, viburnum, yellow or red twigged dogwood, ninebark, spiraea, lilac, and weigela. Whether you plant a hedge for privacy, pleasure or practicality you will be joining an ancient horticultural tradition that will give you joy every time you look at it whatever the season, whatever your reason. I just came across your blog entry in an effort to locate suitable trees (particularly evergreens) for a hedgerow in Ulster County, NY for my brother-in-law. I am a horticulturist, but in Wash., D.C., so I am unfamiliar w/ the plant material in NY. I went to the Cornell Cooperative Extension site but didn’t find much information. Are you aware of any resources/lists for such queries? The hardiness zone conundrum is really throwing me off…trees I keep wanting to suggest aren’t hardy up there! Ugh. I am looking to plant some hedges. I need it to be an evergreen. I have a neghibor that has a big dog and every time we go out she jumps at us. Causing my dogs to bark at her the whole time that I am walking them. We do not have a leash law. So, I just want to fix it where they can’t see each other. He also has a waste treatment plant that runs on to the ground and into my back yard. That is where we spend most of my time. If you have any ideas of a bush and some way to stop the water flow I would greatly appreciate it. I live in zone 7. I am having to be cheap on the buying the plants, something that I doesn’t need a lot of care. Evergreens are the most expensive plants to plant because they grow so slowly- usually about 6″ per year. You could plant an instant hedge of arborvitae. You should think about the ultimate height you want and that will lead you to make the right plant choice. I just came across your site after a mind-numbing search for shrub ideas. We are in upstate New York, Sullivan county (zone 5) near the delaware and have a straight 60′ stretch that we want to plant with a nice thick wall of green to block out our neighbors and the barky dogs. This area gets very bright sun for most of the day, and is at the foot of a mountain which means the ground has lots of water. We have many black locust, norwegian spruce and cherry trees growing just behind this area on the mountain. I don’t want a boring symmetrical line of green giants. I’d much rather have something that feels a little more wispy and organic. At first, I loved the idea of the the willow hybrids ( http://www.fast-growing-trees.com/WillowHybrid.htm ), but it seems they have a very aggressive root system, and this line of shrubs will be about 12 feet from the foundation of our house, and near a water line. I’ve also read they’re pretty wimpy and die out after a couple years. I LOVE the look of the Rhamnus fineline / buckthorn ( http://www.provenwinners.com/plants/rhamnus/fine-line-buckthorn-rhamnus-frangula ) but there is that open gap at the bottom that will permit the dogs to see us and bark. I also totally love the Dwarf arctic willow ( http://www.naturehills.com/dwarf-blue-leaf-arctic-willow ) — but we’d like to get to 5′ – 6′ as soon as possible. Could you recommend a combination of these plants or others? I totally love unusual looking plants, twisted barks etc. The limiting factor is the deer. I know they’ll come for anything when starving (as they were this past winter), but we want a fighting chance! I gather the time to plant is now. Robert-Yes now is the time to plant catching the rainy season. Arctic willows are the smallest of the willows but they still get to a height and width of 7’x 10′ they tend to have a small gap between the shrubs at the bottom. I don’t find their roots invasive. Rosemary willow- Salix Eleagnos is a terrific shrub and they get huge – I am making a hedge of them for a client this spring. Rosa rugosa are suckering shrubs and have both a nice flower over several months and then the bright red hips in the fall. Scotch rose7′ x 9′ makes a terrific dense hedge. Bautiful flowers in the spring and flowers again in the fall. I would go for something that has two season of interest. You really need to determine the ultimate height and then chose the plant you want. Best of luck!